I adore their smiles. I cherish their hugs. I admire their hearts. But, most of all I love that they are my boys. I love these little boys with all my heart + the moments, memories + smallness of my little boys passes all too quickly. So, I love to get them dressed up + capture them in photos that will bring me back to these days once these moments are long gone. I'm sharing 6 tips to create a dapper look for your son with Janie and Jack. 1. Dress your son in a dapper hat. Girls love to accessorize, But I always say, why can't we accessorize our sons? I love to dress my boys in hats. It's a fun way to add a finished touch to an outfit. And, they can take it off to allow for versatility in photos. They are also a great way to keep the sun out of their eyes so the smiles really shine through. I love hats on my boys + I love the selection of hats Janie and Jack has to offer. 2. Dress your son in a dapper bow tie. I think a bow tie is my all time favorite accessory to dress my boys in. It's so much fun to see them all dressed up as a mini man. Bow ties are timeless and a great focal point for photos. The bow tie can be styled to bled in with the outfit or the bow tie could be a pop of color that makes a statement. I love that Janie and Jack offers bow ties for babies as well as my big boys. 3. 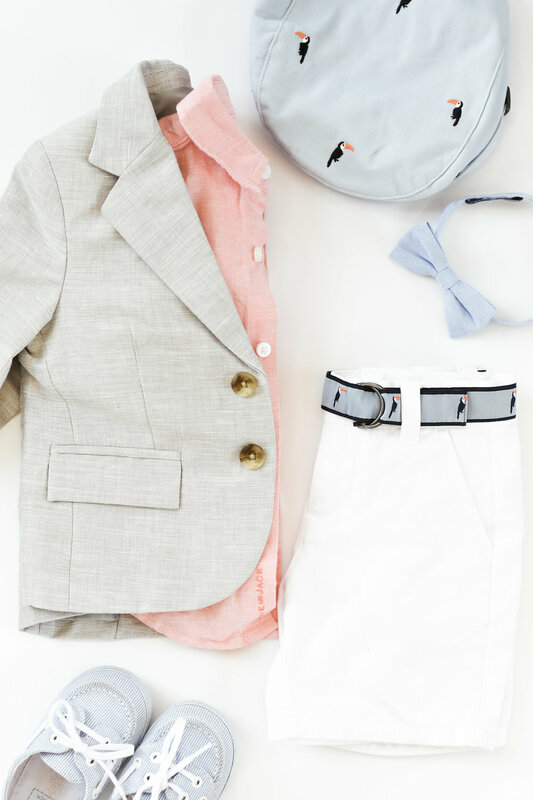 Dress your son in a dapper sport coat. Can I just say that seeing my boys in little sport coats makes me so happy? The sport coats really complete the outfit + bring the outfit to more of a formal, traditional level. Seeing my boys all dressed up really is a special occasion that I treasure. I love that each of the sport coats really brought out each of the boys personalities. The sport coats are also so versatile that can be used for many occasions + can be dressed up or down. 4. Dress your son in a pop of color. Each of my boys had a pop of color in their outfit. And, each outfit had it's own color that tied the three outfits together. Breck and Bowan have similar outfits. Yet, Bowan's shorts gave it a pop of color. And, Breck's jacket brought variety. The three outfits were tied together with the shades of blues and oranges to bring more depth to the photos. Well, baby shoes will always have my heart. And, do you see how adorable Bridger's shoes are? I could take photos of my baby just in a diaper and these shoes and love them. Janie and Jack offers adorable and delicate shoes for babies that become great keepsakes once they out grow them. I absolutely love the traditional look the shoes bring to Breck + Bowan's outfits. Plus, the shoes are very comfortable + my boys love wearing them. The shoes even work perfectly for Breck to wear to school with his uniform. 6. Dress your son in mix + match styles. I love that Janie and Jack provides collections of clothing. It's such a great guide to help style an outfit for your son. It's also a great starting point to help find additional pieces that can be mix and matched for additional outfits. You can find my boy's style collection here. This clothing was provided by Janie and Jack. I absolutely love this brand for dapper looks for my boys. I only share brands and items that I absolutely love + use for my family. Thank you for supporting the brands that support my blog to bring you helpful style posts like this one. What is your favorite way to style your son's outfit for photos?